Jamal Lewis seems like he’s ancient in football terms, but he’s only 28 years old. (He’ll be 29 by the start of the season.) That’s probably because Lewis was a major component in the Baltimore Ravens 2000 Super Bowl title run, back when he was 19 or 20 years old. Since then, Jamal Lewis has broken the single-season rushing record and spent time in prison, which is more than enough for one NFL lifetime. In 2007, Jamal Lewis showed he still had something in the tank, though. After the Baltimore Ravens came to the conclusion Jamal Lewis was finish, they let him go in lieu of Willis McGahee. 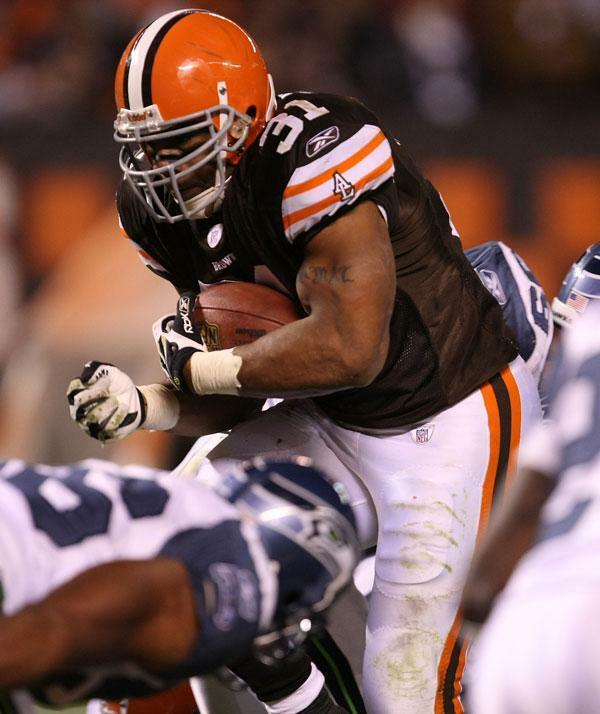 Lewis signed as a free agent with the Cleveland Browns, who had been an NFL doormat since their franchise respawned in Cleveland in the late 1990′s. Lo and behold, the Cleveland Browns became one of the NFL’s Cinderella teams last year — and one of its offensive juggernauts. Now, fantasy football owners are trying to figure out where to slot Jamal Lewis. I’m tempted to downgrade him because the tread is wearing thin, but Lewis is younger than LaDainian Tomlinson and is the same age as Brian Westbrook, so it’s hard to say that Lewis is that much more worn out than the guys at the very top of fantasy cheet sheets. And given the fact the Browns look to be a fantasy scoring powerhouse, he has to be considered a value pick in the 2nd or 3rd rounds of fantasy drafts. Jamal Lewis had a noteworthy freshman year with the Tennessee Volunteers, going for over 1,000 yards and 7 touchdowns. In his sophomore year, Lewis tore up his knee, so that his junior year was a campaign to prove he was fully recovered from the injury. Lewis finished his college career with over 2,600 yards. 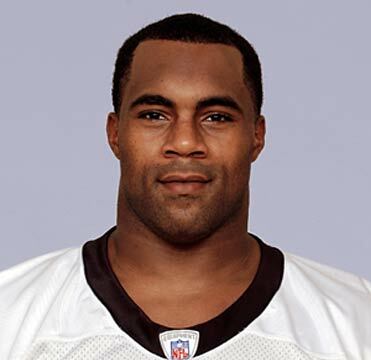 When Jamal Lewis entered the NFL Draft after his junior year, he was regarded as a major talent with serious injury concerns. This did not stop the Baltimore Ravens Ozzie Newsome from taking a shot on the talented young runner. The Ravens selected Jamal Lewis with the 5th overall pick of the 2000 draft. Some wondered about his health moving forward, but the Baltimore Ravens were looking for a rugged back to control the ball and wear down opponents. Lewis combined above average size for an NFL back with blazing straight-ahead speed. The Baltimore Ravens were building a talented defensive unit, but their offense had been inconsistent for years, and they wanted someone to build an entire offense around. Lewis got off to a relatively slow start in his rookie season, mainly because the Baltimore Ravens offense was a disaster. Tony Banks started the season as quarterback, but his continued tendency to throw interceptions hampered the Ravens’ conservative game plan. Eventually, Trent Dilfer became the starting quarterback, but most considered him a cast-off. Through one stretch early in the season, the Ravens didn’t score an offensive touchdown in six straight games. Luckily, the Baltimore Ravens Defense was dominating in a way the NFL had never seen before. The Ravens defense gave up fewer points than any defense (over a 16 period) in NFL history, eclipsing the total of the 1985 Chicago Bears Defense. Therefore, the Ravens stayed in the playoff hunt, despite terrible offensive production. Eventually, Brian Billick began turning the game over to Jamal Lewis. Lewis turned it on in the second half of his rookie season, and was a star by the time of the NFL playoffs. Despite being a low seed and having to go on the road for their playoff games, the Baltimore Ravens used Jamal Lewis and a devastating defensive attack to roll over their AFC opponents. They crushed the New York Giants in that year’s Superbowl. In his fourth season, Jamal Lewis was even more impressive. Lewis had put up solid numbers in his previous campaign; in 2003, he came close to breaking Eric Dickerson’s all-time single-season rushing yards record. Jamal Lewis became one of a few people to top 2,000 yards, which made him a fantasy football stud beyond most measures. Unfortunately, it appeared that his career would end as soon as he reached the summit of the NFL stardom. During an injury-tainted 5th NFL season, cocaine distribution charges came forward against Jamal Lewis. He would be convicted and sentenced to 4 months in prison (during the 2005 offseason), and many wondered if the Baltimore Ravens would release their star running back. His prison stint made it difficult for Lewis to rehabilitate from his injury, and he entered the 2005 NFL season a shell of his former self. Meanwhile, the Baltimore Ravens had failed to solve their problems on offense. The Ravens wasted years on Kyle Boller, who was expected to be their franchise quarterback. Instead, the mobile and strong-armed Boller continued to make bad decisions and seemed confused by the speed of the NFL game. The team would bring in an aging and injury-plagued Steve McNair to give them veteran leadership at the QB position, but the team was forced to continue their conservative play-calling. This meant the team leaned too heavily on Jamal Lewis. Lewis was unable to recapture the form of 2003, and many Ravens fans called for Chester Taylor to be named the starting running back. When Taylor left in free agency for the Minnesota Vikings, Jamal Lewis was left as the only viable running back on the roster. He would soldier on during McNair’s first season with the Ravens, when the team went 13-3 in a tough AFC North. Jamal Lewis proved a dependable back in a real-game sense, but his fantasy numbers were disappointing. After the season, the Baltimore Ravens decided to trade Jamal Lewis in for a younger model, and their trade for Willis McGahee ended Lewis’s up-and-down career in Baltimore. 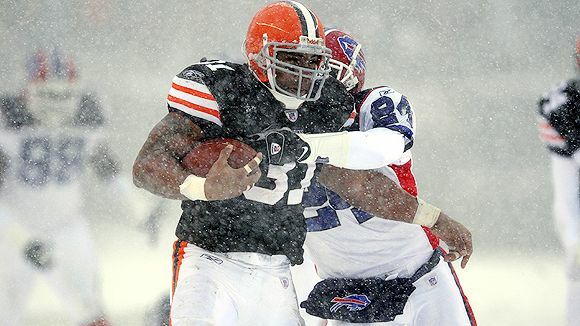 The Cleveland Browns signed Jamal Lewis to a relatively modest 3-year veteran contract in 2007, and he was installed as the team’s starting running back. Many fantasy owners looked at Jamal Lewis as a lower-tiered running back — one of those guys you get if you drafted quarterback and receiver high and you’re desperate for a starting runner. Given the anemic Browns offense, there was little reason to believe Jamal Lewis would have a career renaissance in Cleveland. "Renaissance" and "Cleveland" are two words that rarely go hand-in-hand. When the Pittsburgh Steelers skunked the Browns in the opening game of the 2007 season, the worst case scenarios seemed to be coming true. The opening day started, Charlie Frye, was traded to the Seattle Seahawks in what looked like a desperate move. Most Browns fans wanted the team to start newly-drafted Brady Quinn, essentially giving up on the season in the 2nd week. Instead, Romeo Crennell started Derek Anderson, a lightly considered former 6th round pick and (coincidentally) another castoff from the Baltimore Ravens. 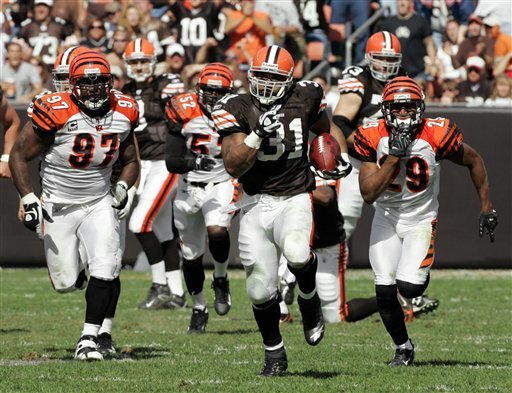 The Browns scored 51 points in Week 2 versus the Cincinnati Bengals. Derek Anderson showed a strong arm and an ability to hit the Browns’ talented targets — Braylon Edwards and Kellen Winslow Jr. — despite a propensity to throw interceptions. Meanwhile, with the Browns passing game shocking opponents, Jamal Lewis found all kinds of running lanes, and suddenly the veteran runner was having a career rejuvenation. This year, Jamal Lewis is slotted in the low 2nd round or 3rd round of most fantasy football drafts. As stated earlier, Jamal Lewis isn’t the old man you probably tend to think of him as. He’s as young or younger than LT and Westbrook, and frankly has a lot fewer carries than those players over the past five years. So the idea that Jamal Lewis has too much wear-and-tear has somewhat been proven wrong. Of course, Jamal is a big back who takes a lot of shots, so those backs tend to wear out a little quicker than the shiftier backs. But Jerome Bettis was still a factor until he was about 30, so there’s no reason to think Lewis doesn’t have another year or two of fantasy production. At the very least, the Cleveland Browns should be in scoring position a lot, so Jamal Lewis should get his share of goal line touches. I’ve always compared Jamal Lewis to Hershel Walker. He’s big and bruising and fast in a straight-ahead situation. When he has to shift his feet and make cuts, Jamal Lewis sometimes looks lost. During his last few years with the Baltimore Ravens, this was a disaster, because the Ravens didn’t have the passing game to keep defenses from stacking the box. In Cleveland, though, that’s not the case. Defenses have to account for Winslow and Edwards, so they won’t be putting 8 men in the box very often. This is a perfect situation for Jamal Lewis. The offensive line is young and improving, while Anderson should be even more comfortable in the offense. The Cleveland Browns offense should improve (if anything) this year, if they can avoid the injuries that have destroyed their plans in most seasons (prior to 2007). All that being said, I would probably grab a stud wide receiver in the low 2nd round and hope Jamal Lewis slides to me in the 3rd. If you got the first or second pick in the draft and you want to pair a running back with LT or AD, then Jamal Lewis becomes a solid veteran on a Top 5 offense — and that’s about all you can expect low in the 2nd round. If that’s your preference, I can see drafting Jamal Lewis low-low-low in the 2nd round. I personally wouldn’t spend a pick on him until the 3rd, at least. That’s because he is a big back with 8 years of NFL pounding, so Jamal Lewis could suddenly fall apart physically one year. The same could be said for runners being drafted a round or a round-and-a-half ahead of Jamal Lewis, though. For instance, Jamal Lewis is the same age (28) as Larry Johnson, who plays in a lousy offense and who has much more immediate injury concerns. Sure, Larry Johnson is a better back at this point in their careers and he will be the focus of the Kansas City Chiefs offense, but being a focus has drawbacks, too. The point being, Jamal Lewis is yesterday’s news, so he still gets underrated in a lot of mock drafts. At a point, the Cleveland Browns’ running back becomes a major value in a fantasy football draft. Jamal Lewis is not a risk I would take in fantasy football in 2009. Jamal Lewis will be 30 before the season starts and he has a lot of wear and tear on that body of his. Given his punishing style of rushing the ball and the fact he came into the league at age 19/20, I would expect Jamal Lewis to be a couple of years older than his chronological age – that is, in football years. Plus, there are two younger backs that the Browns new coaching staff is likely to give a few carries. One is James Davis, the 5’11", 218 pound rookie runner out of Clemson, whom the Cleveland Browns drafted in the 6th round this year. Eric Mangini and the Browns brand new coaching staff are going to want to put their own stamp on the team and James Davis is the only RB on the Browns Roster that Mangini & Company drafted. Also, the Browns have 4th year runner, Jerome Harrison, who was drafted in the 5th round out of Washington State in 2006. Jerome Harrison is a bit smaller at 5’9", 205 lbs, but he has had some moments in his previous three years and should be coming into his prime years in the NFL. I would give Jerome Harrison a higher bump if this were a returning coaching staff and we could say he knows the offensive scheme now, but Jerome Harrison is starting fresh like everyone else. All signs point to Jamal Lewis being the starting running back in Cleveland this year, though. He’s the only truly viable runner on the team and any starting runner in the NFL is worth having on your roster – if nothing else as trade bait after the week they have a big game. Eric Mangini showed with Thomas Jones last year that he loves to run the ball and the RB in Cleveland should have plenty of opportunities – but I wonder how effective Jamal Lewis will be at this point in his career. On the other hand, the Cleveland Browns have been drafting offensive linemen high for years now, and they could any year suddenly have one of the best offensive lines in the NFL. So keep that in mind if you are too dismissive of Cleveland Browns running backs.